When the holidays begin, you know it’s time to feel and look gorgeous. If you haven’t been bothered by your hair and makeup, now is the time to upgrade your look. From hot red lipstick to smoky eyes to sparkly eyes and perfectly powdered face, you need to embrace the party look for the holidays. Here’s what we have in mind when it comes to hair and makeup for the holiday season. Make your eyes stand out by using a black pencil to create a perfect smoky eye. Give your smoky eye some extra wings to give it a more dramatic effect. If you will be wearing a dress that shows off your neck, consider having your hair rolled up with a side bang and tied on the back with a clip. It’s a great way to bring out that traditional look and elegance. You just can’t go wrong with some braids during the holidays. You don’t really have to braid your whole head. You can just tie a ponytail and roll up a loose braid on the side. Keep the braid messy but beautiful. They say few people can get away with pink above the cheeks but when you do it right, you’ll look stunning. Consider matching some pink lipstick with pink eye shadow. Use a mascara to define your beautiful lashes and a black pencil to make the eyes pop. The good thing with wearing pink lipstick is that it distracts people eyes from staring at your blemishes. Remove all polish from your nails and clean them with some lemon juice. Use a moisturizing lotion to massage your nails and moisturize the cuticles. Then apply bright colored polish. Use a deep conditioning treatment to moisturize your hair and give it that healthy and shiny appearance. Find a good moisturizer that suits your skin type. Apply it on the face at least twice a day to avoid dryness and flaking. Wash your hair and leave it to naturally dry. Avoid using too many products that weigh down your beautiful hair. Don’t make the mistake of over drying it or you’ll reap all the moisture that makes your hair look nice and shiny. Sprinkling some translucent powder on the roots of your hair can actually make it look better. Need to look your best for a special event this holiday? 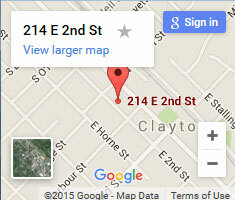 Book an appointment with us here at Clayton Hair Salon.